Somerset Offices Convex Squares Frosted Architectural Glass Wall. Conference Rooms can be small and tight. At the same time, they can also be very dark. 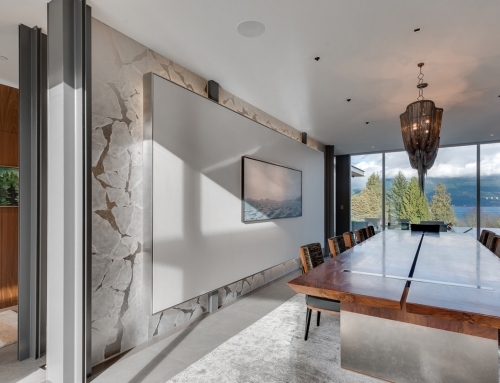 As such, they are not always the most desirable spaces to hold meeting. 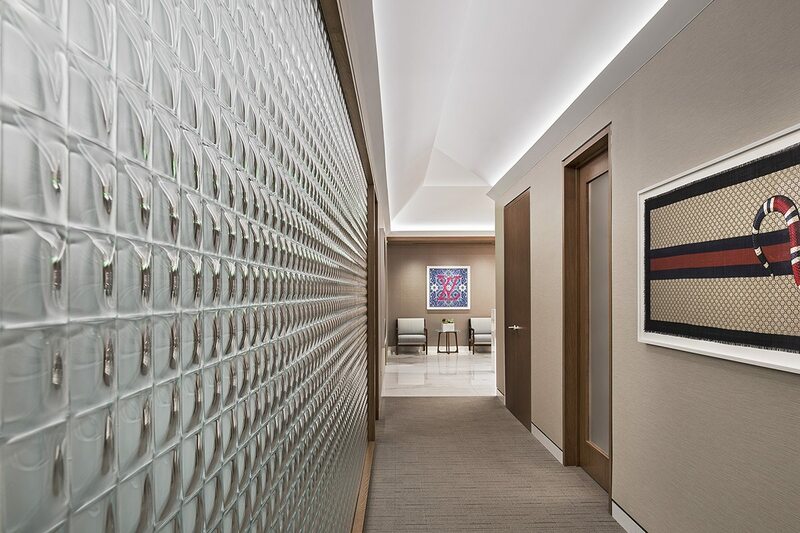 As a result of this, Neumann Smith Architecture sought to illuminate the Somerset Offices. 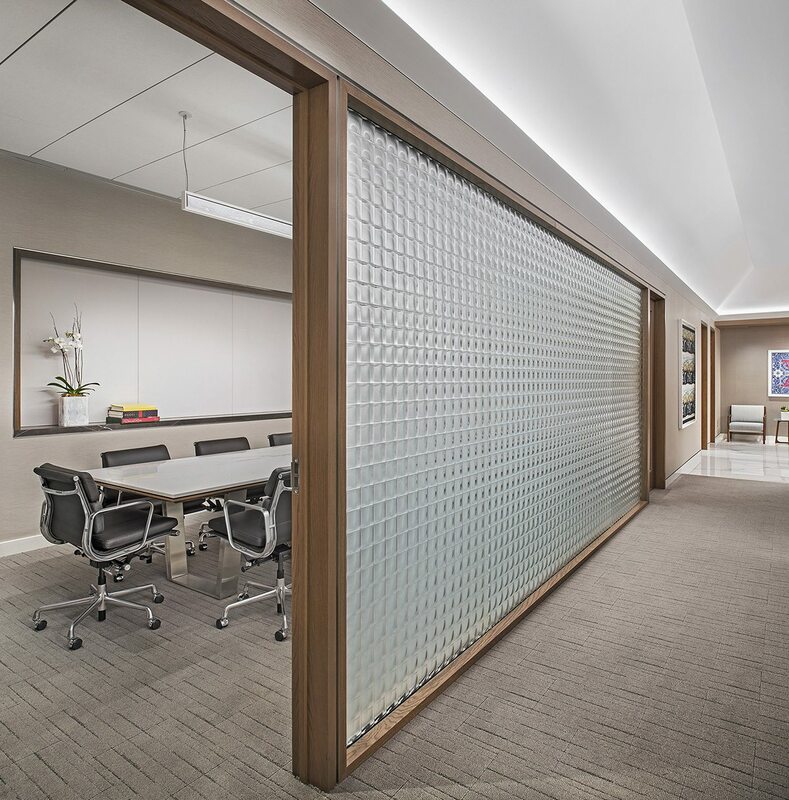 In particular, they eliminated basic dividers and replaced with exciting 3-Dimensional Convex Squares Frosted Architectural Glass Walls. 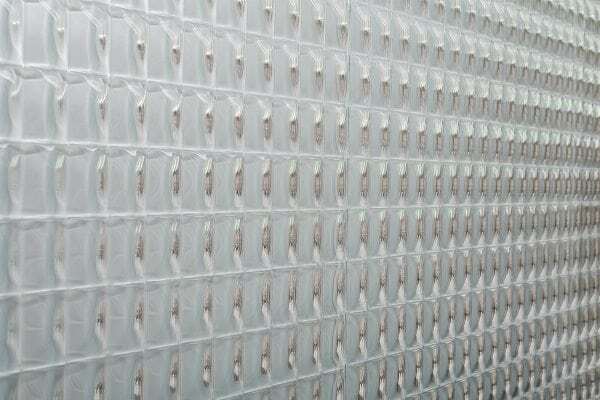 Convex Squares Frosted Architectural Glass Wall is part of Nathan Allan’s Josiah J Collection. 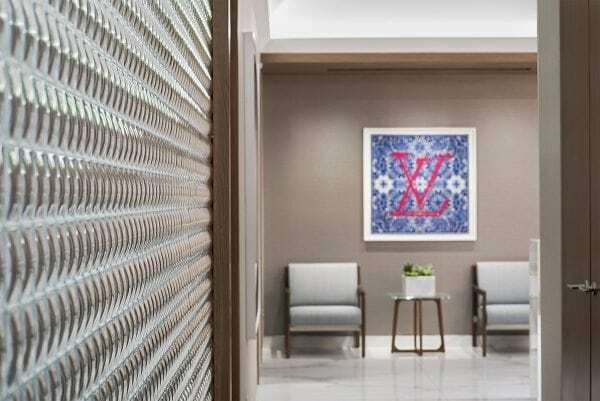 The architectural pattern is deep and bold. 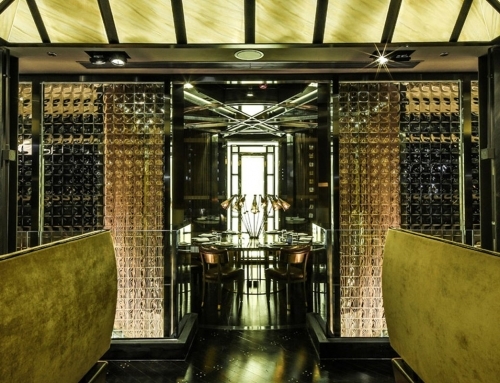 Therefore, the glass forms a unique 3-Dimensional surface pattern. Accordingly this pattern creates a distortion privacy feature on its own. However, to add an even more effective opacity, a frosted finish was added. 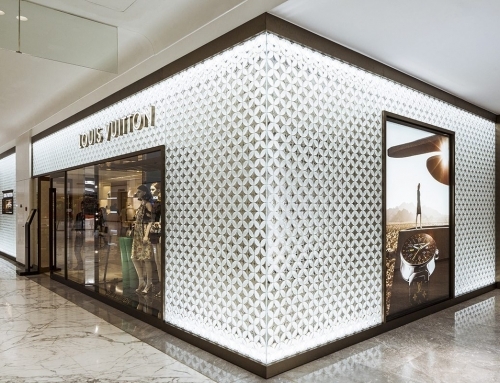 As a result, this Convex Squares Frosted Architectural Glass Wall is both decorative and functional. 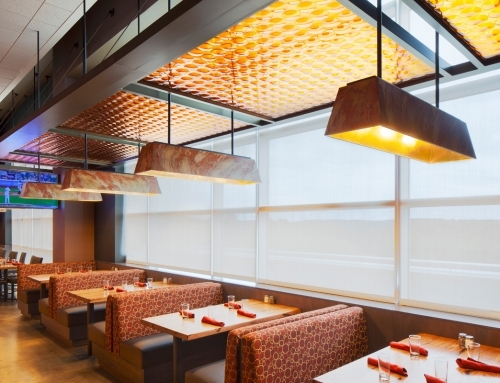 Panels allow for great light transmission, while emanating a soft white glow. 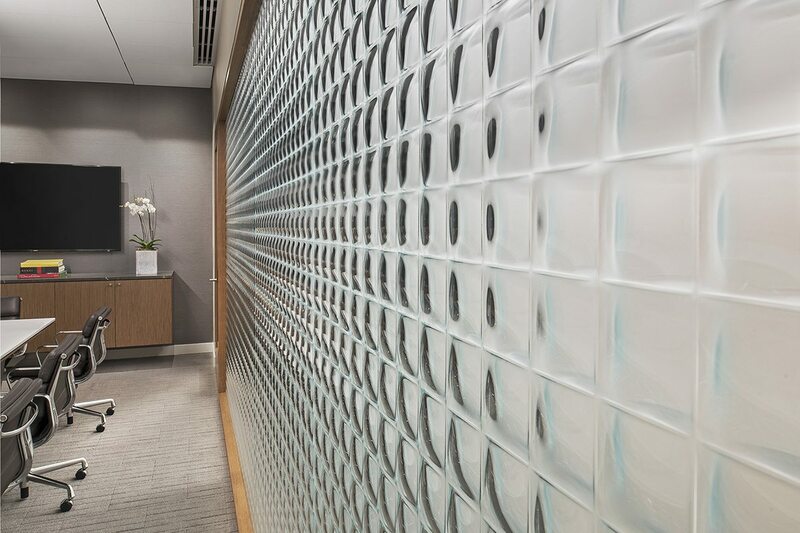 5 large panels, 42” x 104”, are used in this Convex Squares Frosted Architectural Glass Wall. 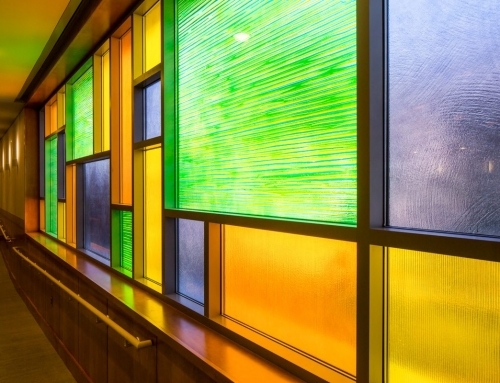 Each panels is 3/8” (10mm) Low Iron glass. In addition, each panel is safety tempered. A frosted finish is applied to each panel to increase the opacity/privacy level. Furthermore, flat margins are created on all 4 sides of each panel. Because of the flat margins, the panels line up perfectly, edge to edge. Installation was performed Modern Mirror and Glass Company, Roseville MI. 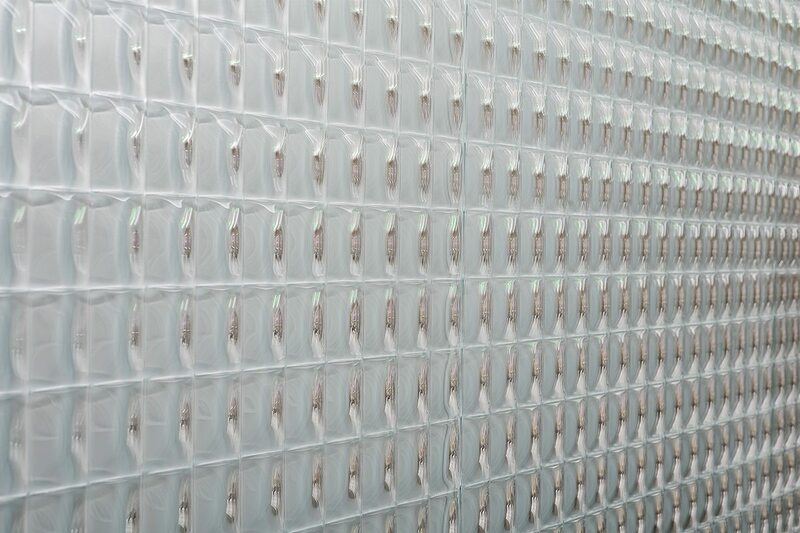 Soft, glazing cushions are inserted under each glass panel. As such, the cushions lift the glass off a hard surface, protecting the glass. In addition, moldings are installed on all edges, both sides of each panel. Likewise, the flat margins allow for the moldings to press tight against the glass surface. Finally, panels are joined together with a fine bead of silicone, between vertical edges. Also, all perimeter edges receive a silicone bead.